The Tigers have a rich history of winning in the nation's toughest conference. That should continue again this season. Jordan Jefferson returns but will decline due to the loss of fantastic wide out Brandon LaFell. 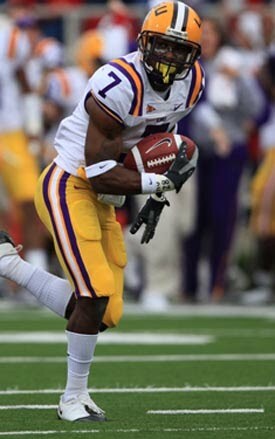 Luckily for Les Miles he has a talented backup in Jarrett Lee. Jefferson does have someone to pass to. Terrance Toliver returns and could be a talented long ball threat. The offensvie line returns many but it is still not a strength. On defense the Tigers have had tons of talented lineman. Just too name a few: Glenn Dorsey and Tyson Jackson. This time the defensive star is in the secondary with Patrick Peterson, an All Conference Selection. On the line, things are not looking up. Only senior Lazarius Levingston returns. Kelvin Sheppard is one of the few stars in the linebacker core. Meanwhile, in the secondary even with Peterson the Tigers need another talented back after they lost safety Chad Jones. On special teams, both punter Derek Helton and kicker Josh Jasper return. Key Games: Sept. 4 vs. UNC Quick Pick: Both teams have a decent quarerback and a talnted wide receiver. But the UNC D is much better than the Tigers. UNC wins. 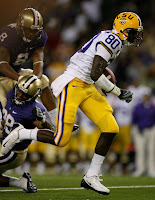 Oct. 9 vs. Florida Quick Pick: Patrick Peterson picks off John Brantley twice and the Tigers escape. LSU wins.